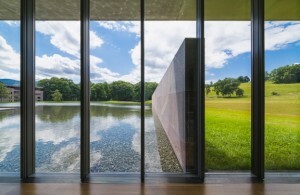 A thermally advanced curtain wall helps visitors to the Clark Visitor Center (Williamstown, Massachusetts) enjoy the woodlands surrounding the gallery. A two-story glass lobby featuring a thermally advanced curtain wall is the focal point of the Clark Visitor Center in Williamstown, Massachusetts. 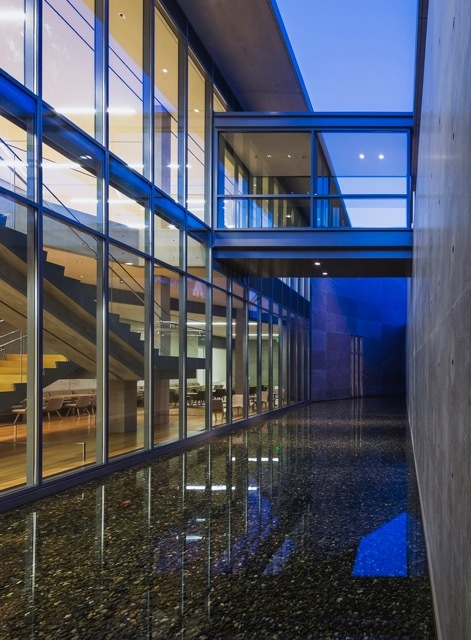 Designed by Pritzker Prize-winning architect Tadao Ando, the new 3902-m2 (42,600-sf) building is part of the Sterling and Francine Clark Art Institute, which has undergone a 15-year, $145-million expansion. Ando says creating transparency was integral to the new spaces, given the campus’s 57 ha (140 acres) of outdoor woodland. Light from the open lobby spills down into more than 1022 m2 (11,000 sf) of new gallery space, some of which is below ground level. The lower-level galleries are partially situated beneath a green roof that forms an exterior courtyard at the facility’s main entrance. The lobby overlooks the reflecting pool; a glass and concrete stairway accesses the galleries, dining, and family areas located below it. The building features multiple complex, tight angles and sharp corners, requiring the 1115 m2 (12,000 sf) of curtain wall be fabricated to exact measurements and assembled perfectly. Crews glazed the system in situ, using double insulating low-iron glass with a laminated inboard lite, stainless steel spacers, and a spectrally selective low-emissivity (low-e) coating. At the Clark, the glazed assemblies used to maximize daylighting are amost works of art in themselves. In addition to energy efficiency, the curtain wall is resistant to condensation—a particular concern for high-humidity applications, such as museums. The center’s curtain wall aluminum framing was finished using a three-coat 70 percent polyvinylidene fluoride (PVDF) resin-based gray coating. The finish meets American Architectural Manufacturers Association (AAMA) 2605, Voluntary Specification, Performance Requirements and Test Procedures for Superior Performing Organic Coatings on Aluminum Extrusions and Panels. The light, views, and thermal performance contributed to the Clark’s Silver design and construction criteria under the Leadership in Energy and Environmental Design (LEED) program.